Look at your hand. Closely. Look at the skin, the nails, the veins, the tendons. Watch your knuckles and the muscles as your hand moves. Every single cell in your hand was once food. 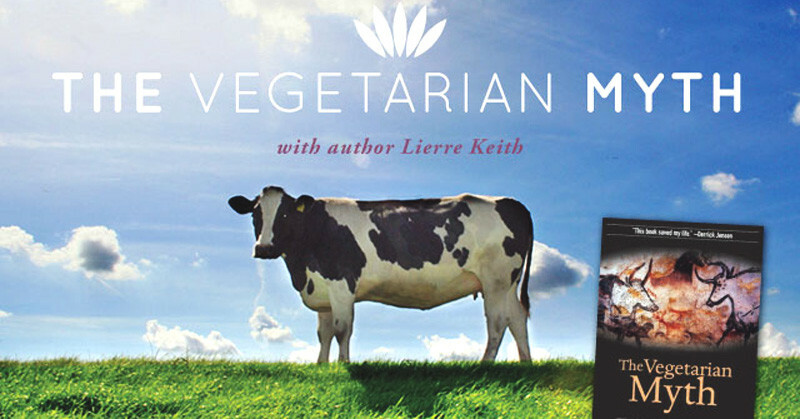 Every movement it makes is because of the energy provided by what you ate. Pretty straightforward, right? Yes and no. It’s a fundamental principle that no one can argue. And yet, we don’t live as though it’s true. 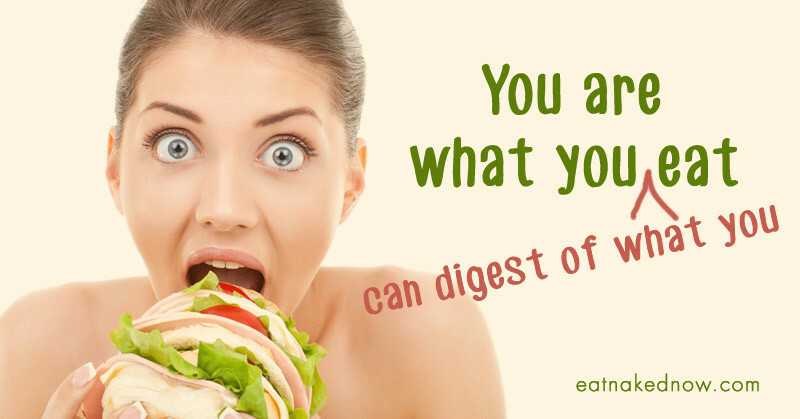 Furthermore, it’s not as simple as “you are what you eat” because you’re only as good as your digestion allows. 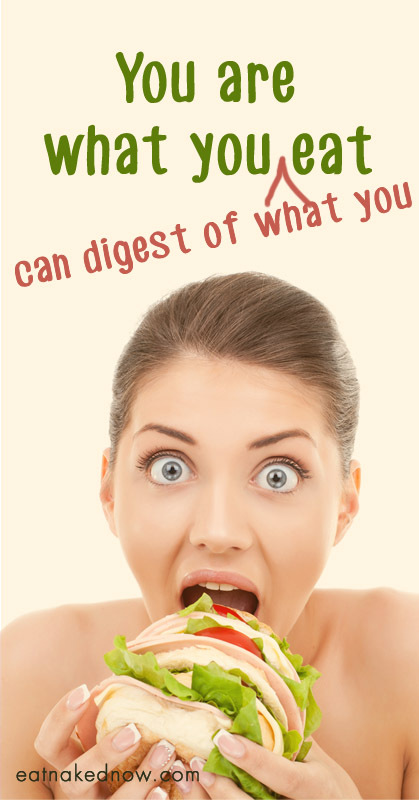 Your digestion is the gatekeeper, breaking down food into nutrients and then assimilating them into our bodies. You may be eating the best, the cleanest, the most organic and naked food around, but if you’re not digesting it properly, then it’s all for naught. Let’s play this out with a specific example: my all-time favorite (and much maligned) nutrient, fat. Fats have many roles in the body, but one notable structural role is that they form what’s called the “phospholipid bilayer” – part of the cell membrane of every single cell in your body. The phospholipid bilayer facilitates the entry of nutrients and energy into your cells, and the removal of waste materials from them. Pretty important role, right? The health of that phospholipid bilayer is integral to the healthy functioning of our cells. So let’s say your fat digestion is compromised from years of eating a low-fat diet or, on the flip side, a few too many transfat-laden French fries. Both low-fat diets and those laden with poor quality fats (sadly almost universal in our modern diet) will negatively impact your body’s ability to digest and assimilate the good fats. This directly affects the health and integrity of that phospholipid bilayer, which means nutrients can’t get into your cells and waste matter can’t get out of your cells as effectively. This is just one example of how your digestion affects one important role of one macronutrient in your body. The same principle can be applied to every role of every nutrient your body needs for optimal form and function. I have said before that there is no neutral when it comes to diet: you are either eating something that will bring you closer to true health and vitality, or you are eating something that will bring you closer to degenerative disease. While I still stand by that claim, as you can now see your digestion plays a critical role in this dance. In fact, it goes deeper: a compromised digestion creates its own toxicity, which causes a whole host of additional problems. But in the problem lies the solution. Several years back I had the good fortune of studying directly with one of the world’s leading experts in digestive health, Dr. Natasha Campbell-McBride, creator of the GAPS diet. 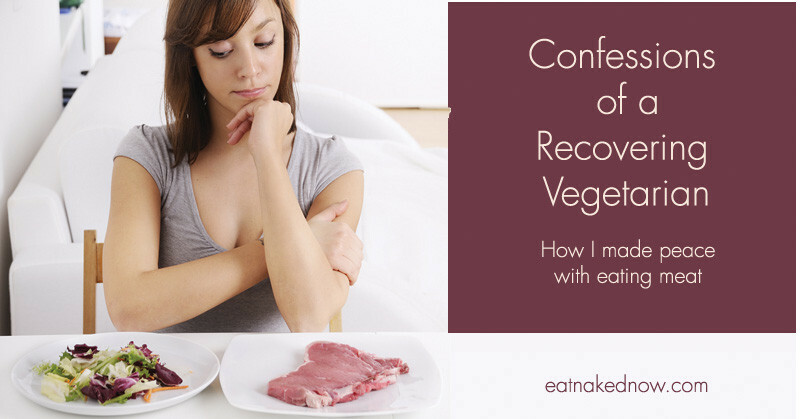 She made some very powerful observations when it comes to the connection of our digestive health to pretty much everything that ails us, and this is through the concept of cell regeneration. You see our bodies are equipped with powerful self-healing mechanisms. We are designed for repair and healing, and cell regeneration is a critical part of this process. Every cell in the human body regenerates. You have new gut tissue every few days. You have a new liver every two months. Over the course of seven years every single cell in your body will renew itself. The repercussions of this are significant. If you are what you can digest of what you eat, and if your body is constantly regenerating itself at a cellular level, then you have a truly powerful healing opportunity by ensuring a strong and vital digestive system and eating a quality diet. In my professional opinion, diet and your digestion are the two most critical foundations to your overall health, and should be a part of any comprehensive wellness program. 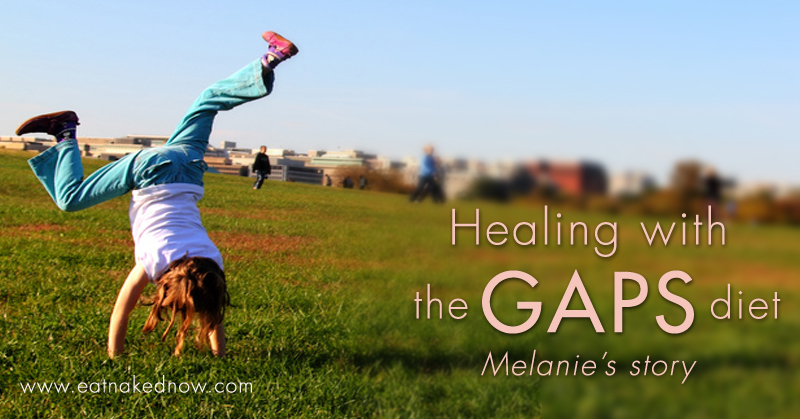 My colleague Melanie Christner, a fellow GAPS Practitioner and NTP, has created an outstanding 10-week online program that will guide you step-by-step through the powerful gut healing GAPS protocol created by Dr. Natasha Campbell-McBride. Her next class starts Monday, June 16th and registration is open NOW. Get more information and register here.